Having a deck will bring lots of enjoyment to your outdoor space. It increases the living area of your home by giving you an entertainment space to love the outdoors. You have unlimited possibilities with your new deck design. We can assist you in designing the perfect deck you’ve always wanted. 1. Repair the Deck You Already Have. When your deck was new, you loved it. But now it is worn out. Your deck may need staining or repair. We can troubleshoot your existing deck. 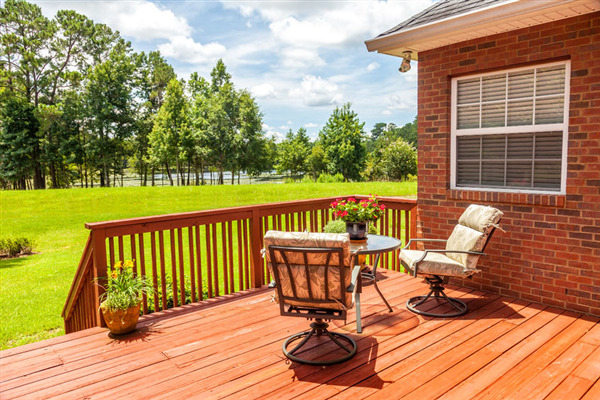 A professional deck builder can make sure your existing deck is safe to use, without rot, and ready for hours of outdoor entertaining. 2. Upgrade Your Existing Deck. If your deck too small? Is your deck just not laid out the way that you would like it to be? Does the deck you’ve always wanted need a roof? Our professionals can take the existing deck you have and incorporate it into a plan for a new more functional space for your outdoor entertainment needs. 3. Build a Brand-New Wood Deck. Do you have that spot in your backyard that you always wanted to make into an entertainment space? We can build decks around swimming pools, hot tubs, and any other outdoor feature that you would like to include in your design. That new deck can become part of an outdoor kitchen or take advantage of a nice view. Our professionals can work with your site and come up with a new deck concept that will fit your lifestyle and entertaining needs. ● Permits and Restrictions. Before beginning any deck project, you first need to consult with your local municipality on any permit needs or restrictions for your deck project. We can assist with getting any needed permits and comply with any neighborhood restrictions you might have on your deck project. ● Deck Materials. There are different types of lumber available at building centers. Lumber has different uses. "Treated" lumber is good for outdoor use, but did you know that this wood might not be good for “ground contact?” A professional can assist you in deck designing and a professional deck builder knows to utilize the correct materials so that your deck has a long life. ● Staining, Painting, and Sealing. One of the great things about utilizing wood for your deck project is that it leaves you lots of options for colors. You can choose to stain, paint, or seal your deck. A professional deck builder can recommend smart choices for durable finishes for your deck. Ready to Get The Wood Deck You’ve Always Wanted? Intelligent Design has professionals on staff to repair or upgrade your existing deck. Our design team can design your new deck for years of enjoyment. For all deck installation and restoration, give us a call at 763-315-0745, or you can message us on our contact page.